This carefully hand crafted solid 9ct Recycled (Eco) White Gold ring is polished to shine. Perfect as an ethically minded engagement ring, commitment ring, celebration ring, or simply as a beautiful gift, or lovely treat! This ring can be personalised with an engraved message on the inside of the band for a small additional charge of £40. If you choose to have your Slade Fine Jewellery item engraved this will add an extra 10 days on top of the advertised delivery time. This ring is also available with a variety of different gemstones, and in a variety of different metal types. If you would prefer this ring set with a different gemstone (sapphire or emerald for example) or made in a different metel (18ct white, yellow or rose gold for example) then please do get in touch and I will be happy to arrange a bespoke order for you. Solid 9ct Recycled (Eco) White Gold and Set with 1 x 3mm Round Brilliant Cut Ethically Sourced, Conflict Free White Diamond. 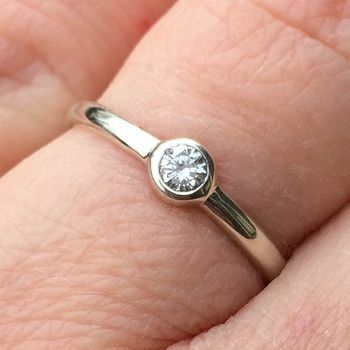 This lovely ring is handmade out of solid 9ct Recycled (Eco) White Gold and is set with 1 x 3mm Round Brilliant Cut Ethically Sourced, Conflict Free White Diamond. The band is 2mm in width. This product is dispatched to you by Slade Fine Jewellery.